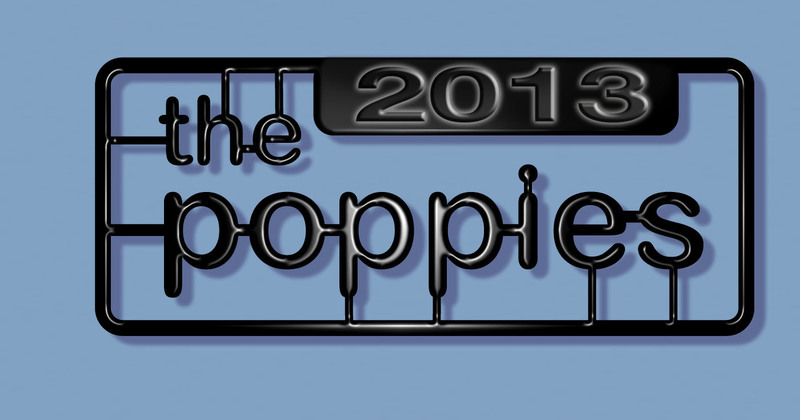 Welcome to the Poppies for 2013 - the only industry awards for pop culture collectibles! Each year a panel of judges from the industry - companies, media, artists, retailers and collectors - assemble to nominate and then vote on the very best collectibles in 18 categories. This year there were 150 judges on the panel, and they debated and nominated and voted, then I tallied! The results are now final, the awards complete, but I'm sure the discussion has just begun. The Poppies have their own physical award, started a couple years ago, A couple of the winners did me a solid and sent back a photo of the award with the toys - or the team. 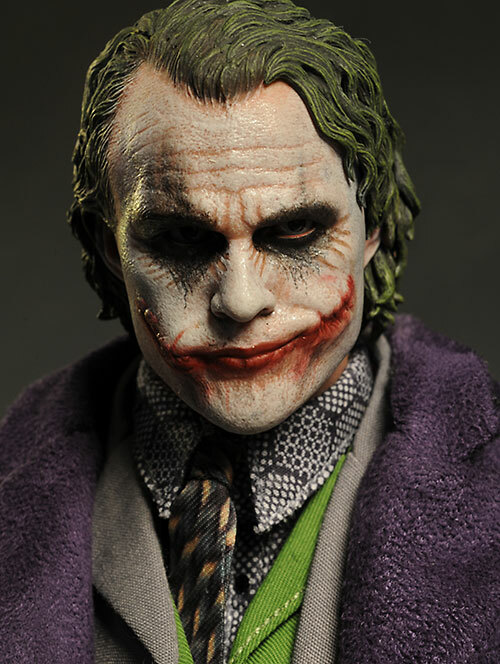 Check out this shot from Sideshow, and this one from Mattel, to see what the plaque looks like. I've also done my own set of bests and worsts of the year for comparison, and don't forget that we also have the People's Picks awards, where readers vote on the same ballot as the Poppies judges. I'll have a comparison of the results of those two with the results of the Poppies as part of each award below, and in those tables there's links to see every collectible. Remember, there's a lot fewer voters in the Poppies than in the People's Picks. That means a vote here and a vote there makes a much bigger difference with these awards, and it also means ties are far more likely. I predicted in my tally of the People's Picks that there were be a lot more difference in the results between those winners and the Poppies winners. You can ignore my picks, since of course the tastes of one person will vary from the larger group, but in many of the past years the results of the other two votes were very similar. My prediction of great variability wasn't looking good as I worked on this first category. The third place winner in the Poppies, just like the People's Picks, is Sideshow. They took 9% of the vote, and I have to say it makes sense. They had a great year across a very wide variety of licenses, making fans happy more often than not. Second place goes to NECA, again the same result. Here, they took 15% of the vote, and capped off a terrific year. It's not just the same result, it's the same vote percentage! NECA had a ton of great figures, and their previous woes with paint quality seem to be a thing of the past. Their Predator line is a particular favorite, especially the amazing Dutch figures. And of course, the winner is no surprise - it's Hot Toys. They grabbed 31% of the vote, but it is worth noting that this is less overall than they grabbed with the People. Still, you can't get much better than snagging a third of the voters! So I continue tallying...and sure enough, things don't seem to be varying too much. I couldn't be that wrong, could I? The bronze goes to the Hot Toys Iron Man 3 series. Personally, I think it's their work on Tony Stark more than Iron Man that set these figures apart. 10% of the voters agreed. On the podium with silver is Hot Toys Batman. Clearly, there's still enough of us Bat-geeks out there to keep him in the top three, and 15% of the voters went for the Caped Crusader and his colleagues. And once again, the Hot Toys Avengers take the first place spot, this time with 31% of the vote. There were so many good releases in this series, and the theme allows for a greater variety of characters than either Iron Man or Batman. 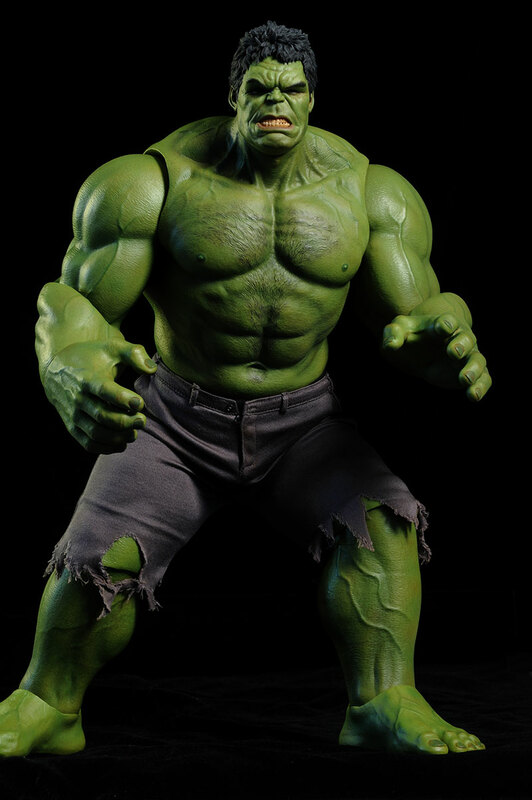 We also got the Hulk this year, a figure collectors had been waiting for with great anticipation, and Hot Toys didn't disappoint. Finally - a little variation! Not a ton mind you, but the Poppies judges weren't on the exact same page as the People this time around. That's because they didn't forsake the terrific Teenage Mutant Ninja Turtles by Playmates, giving them 13% of the vote and the bronze medal. These guys had a terrific amount of variation over the year, with lots of cool releases. They also sold extremely well, right up through Christmas. They are proof that action figures still sell when they are done right, and kids do care about great sculpts, paint, accessories and articulation. 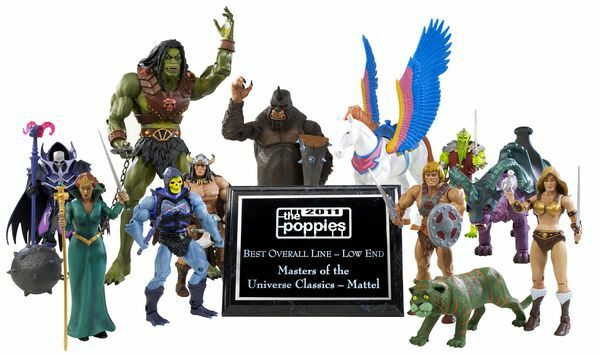 While Mattel's outstanding Masters of the Universe Classics still got some love from the people, the judges were a bit more friendly. With 14% of the vote, this consistently fun series took second place. 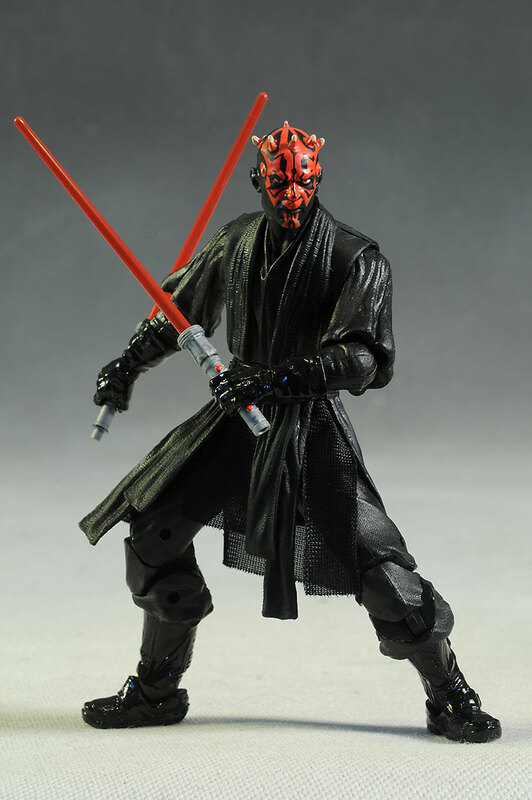 But the winner remains the same - Hasbro's Star Wars Black series. I'm glad to see it too, since Hasbro should be rewarded for giving collectors what they've wanted for years. The figures are extremely well done, and the larger scale works with this style. Ah - I told you there would be some big differences! And in this category, there's a big one. This category also has our first tie, a three way affair for third place. With 11% of the votes, the Sauron Premium Format statue from Sideshow, the 1/4 scale DKR Batman from Hot Toys, and the Jungle Disguise Dutch from NECA all grab the bronze. At least the Dutch was on the People's Picks, in the same position. In second place, with 13% of the vote, is NECA's Spider-Gremlin! That's a figure that the People didn't notice, but I know that several of the Poppies Judges mentioned it to me in the nominations process, and they were amazed by the exceptional paint work. Perhaps it just didn't get enough exposure with the rest of the world. I bet it's no surprise that Hot Toys won this category again this year, since amazing production paint is their bread and butter. But the specific winner might be a bit of a surprise, since it's not the BD T-800 that the People loved so much. Instead, 21% of the judges went with my favorite, the DX Joker 2.0. Perhaps it's because the collectors have grown tired of the rehashes of this same character, but you can't deny the amazing job Hot Toys did on the face. I'm hopeful that we'll see even more terrific releases in this scale in 2014, especially from NECA, Hot Toys and Enterbay. I mentioned in the People's Picks that I was impressed that NECA could hold their won in this category, since their figures are so much cheaper in cost. It's even more impressive with the judges, since NECA took two of the three spots outright. They picked the 1966 Batman for their third place spot with 11% of the vote. It helps that fans of the show have been waiting years and years for any collectibles, and this quarter scale figure is perhaps the very best produced so far. In second place is another NECA Batman - the 1989 Batman. I love this guy too, and the restricted nature of the costume actually plays nicely into the overall design. 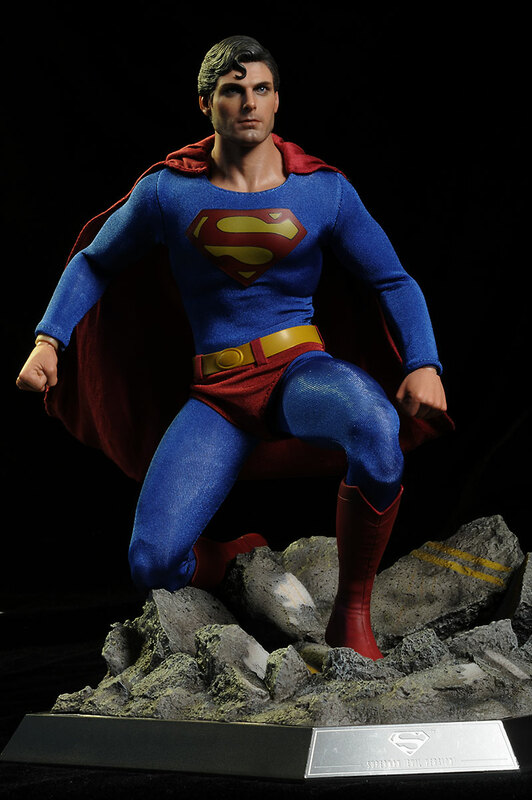 The cape and likeness are top notch too, and he can hold his own with much more expensive collectibles. A solid 17% of the voters were in agreement. But the winner? 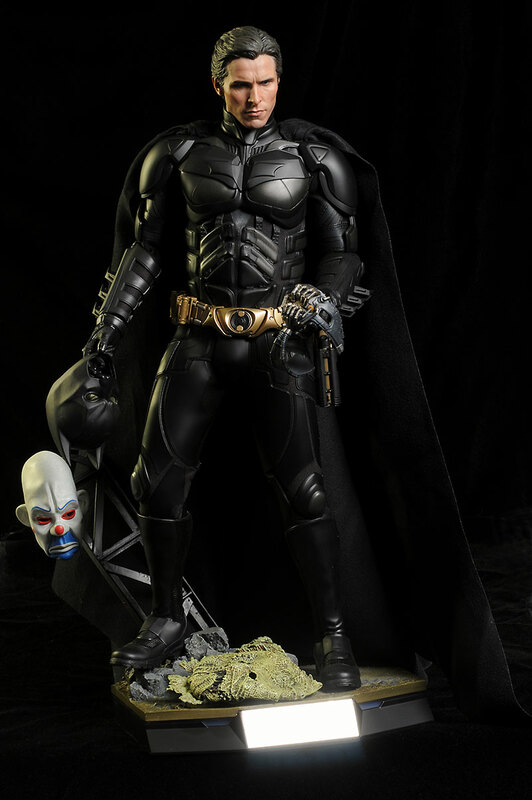 Yea, you know who it is - the DKR Batman from Hot Toys. I'm not surprised since he was my pick too. While he was very expensive, he was well worth it with, multiple heads, a light up feature, a ton of accessories and an amazing outfit. He took the top spot with 24% of the vote. I think the biggest surprise - at least for me - was in this category. I was a little surprised to see the Battle Damaged T-800 snubbed in the Eddie Wires category, but in the Best Male Figure 12 - 17"? No way. Way. But let's start with third place, another tie. This time it's between the cool Tamashii Nations C-3PO, one of the best Star Wars figures this year, and the equally cool Sideshow Joker. They've started off their DC license with a bang, and it's really nice to see the judges appreciating it. Both figures pulled in 10% of the vote. The second place winner was another surprise - it's Tony Stark, the 'workshop' version. With a ton of extras that are a perfect addition to the Hall of Armor display, I'm not surprised people like the figure...I'm just surprised that 15% of the judges picked him as the best, giving him the silver medal. The top spot went to my favorite - once again, it's the Joker 2.0, also known as DX11. 22% of the judges picked him, agreeing with me on the value of the multiple portraits, PERS, and extra clothing and diorama pieces. Sweet! No big surprises here - everyone was in pretty close agreement. The judges did pick the Mantenna from MOTUC as their third place finisher, with 8% of the votes. This guy was definitely a stand out in the series for the year. Second place goes to Dutch from NECA. While the judges nominated the Jungle Disguise version, just about every one of the various versions was top work, with excellent sculpts, paint, articulation and accessories. The big winner? 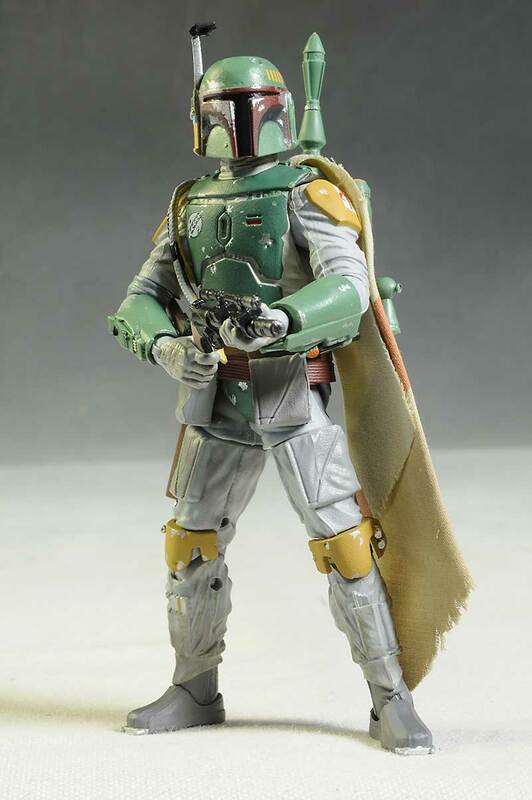 Yep, you can't fight the Fett - it's the Star Wars Black 6" Boba Fett. Hasbro has some big plans for this line in 2014 - I can't wait! While not in exactly the same order, the Poppies Judges did agree with the People on which three figures belong in the top. They went with Mega-Man, from D-arts, for the third place spot as well, with 12% of the vote. I've never been a fan of the character, but I have to say that this is an excellent looking version. 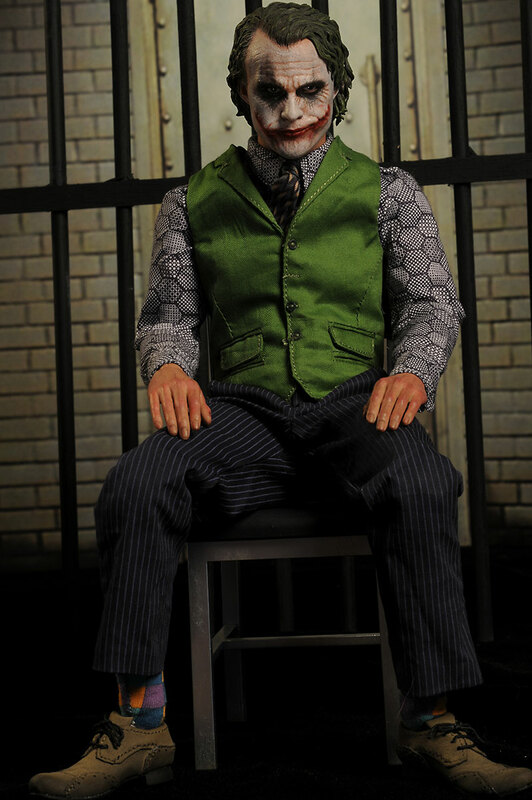 They picked Merle, from McFarlane's Walking Dead series, as their second place winner, giving him 19% of the vote. I have to say that for all the ragging I did on McFarlane for the first couple waves of figures, they really upped their game in the second half of the year. Merle was a real stand out as well, with a terrific portrait considering the scale. The top spot goes to Hasbro - they're top of the heap a lot in this scale. The winner is their Ultimate Storm Shadow from the G.I. Joe Retailiation line. Joe fans may not have been thrilled with the movie, but they responded much better to the figures from Hasbro. Storm Shadow took 27% of the vote. If you recall, Hot Toys swept this category with the People. They didn't quite pull it off with the Judges, however. The big difference is the third place winner. Mattel's nifty 1966 Batman television show Catwoman took that spot, grabbing 11%. I don't own a lot of 'dolls', but I had to have this one. The second place spot went to another Catwoman - Selina Kyle from Hot Toys. A solid 31% of the vote went to the lovely lady from the Dark Knight Rises, fragile mask and all. 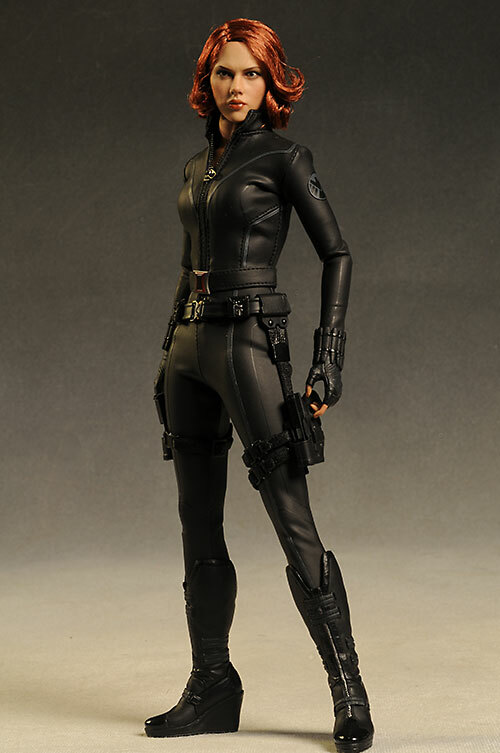 The winner was no real surprise - it's the Hot Toys Black Widow. I agree with the 34% of the judges that picked her for the honor. She's a gorgeous figure, and a real improvement over their original version. There's plenty of great choices here, but the judges had three clear winners. With 13% of the vote, Octavia takes the bronze. Again, the people pretty much ignored MOTUC this year, as did I. But the judges still have some love for the line, and it continues to be a major player for collectors. Next up is She Hulk from the Marvel Legends. I'm kind of surprised by the number of people that love this figure, but it's clear that they do. A strong 18% went for the ruby red babe. As I said with the earlier tally, the winner is a figure I actually panned, although I never formally reviewed it. Mattel's 1966 Batman television line had some hits and misses, and 26% of the voters thought that Catwoman was definitely one of the hits. I'm repeating myself here, but it's worth repeating - while the figure was originally marketed as Julie Newmar, some later claimed it was Lee Merriweather...and the war rages on. There will never be any winner in this Nerd-bate, because it doesn't look like either. Perhaps that's it's strength, since it appeals to fans either way. We have ourselves another one of those pesky ties in this category. There's two figures that ended up with 10% each - Terra Firma, from the Outer Space Men (so glad to see this series getting some love! ), and the super cute Cu-Poche Sabre from Kotobukiya. Both were a surprise to me, but they are certainly deserving. Hasbro did slip in with a silver win, taking 13% of the vote. Their Black Widow is very well done, with nice articulation and a surprisingly good sculpt for this scale. 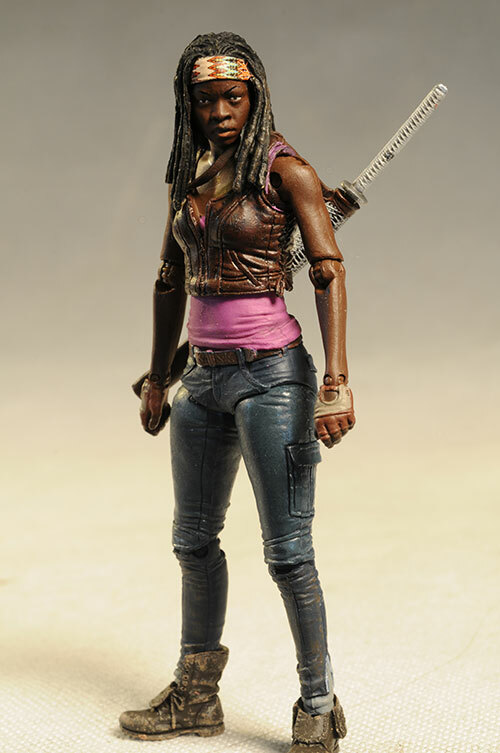 The top winner is Michonne from the Walking Dead, another hit from McFarlane. Andrea wasn't quite as nice, but overall this series is on an upward trajectory, and Michonne is an excellent example. The Judges went for the same three for their top spots....just a very different order. Third place usually means low double digit or even single digit percentages, but not this time. Third place took a solid 22% of the vote, enough to win in other categories. I have never seen the entire wave of Marvel Legends that make up Rocket Raccoon, but I've seen the final BAF and I have to agree that he's mighty cute. Second place was grabbed with 25% of the vote, with Iron Monger barely edging out his Marvel Legend furry cousin. I always thought this Monger was a little too small, but clearly a lot of the judges loved him. My favorite BAF of the year was also the favorite of 26% of the judges, enough to win first place. I love it when a company goes back to an old property and does it right, and that's what DST has done with the Munsters. 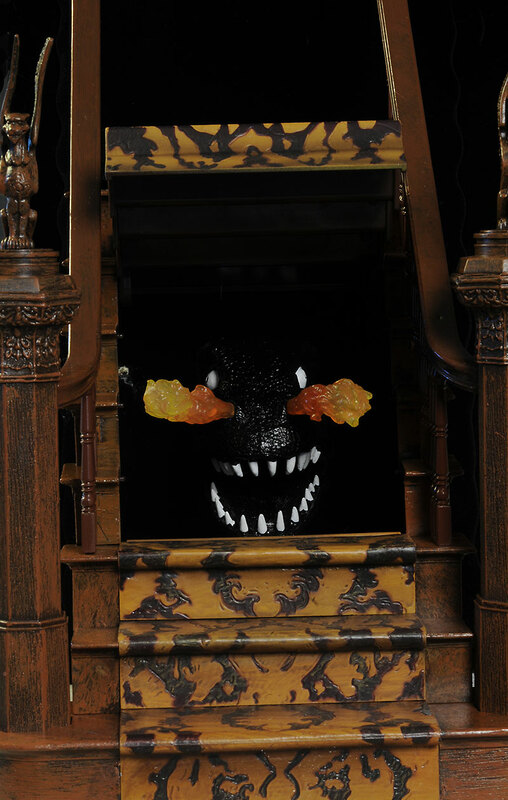 Their Munsters Stairs and Spot is a huge BAF (or BAD, or BAA, or whatever you want to call it), better than most dioramas that are sold on their own. It was well worth picking up the entire series of figures just to have the stairs, and that's about the best compliment you can give any BAF style extra. Once again, the people and the judges agree on the top three...but not which is the best overall. The Hall of Armor from Hot Toys took just 7% of the vote, but that was enough to grab third place. That's because a) it really is an amazing set up once you have all the suits in one, lit up behind Tony and b) the two top winners took a huge percentage of the vote.. The second place winner grabbed a whopping 33%, and it was the People's favorite - the Hot Toys 1989 Batmobile. You have to have some serious cash to own it, and you have to have some serious space to display it, but it is an amazing vehicle. Can you imagine how cool it will be to have the Tumbler, the 89 Batmobile, and the 66 Batmobile all on display? It was a VERY close race in this category, and the winner took the top spot with 35% of the vote. 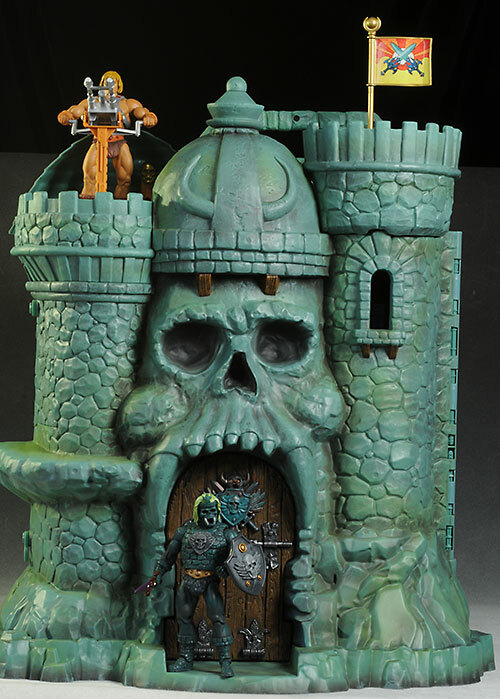 You know there's only one other possible winner, and yes, it's Castle Grayskull. This was one of the best toys produced all year by any company, whether you were a collector, a fan or a kid. Even better if you're all three! This year, the statue and bust categories were very, very tight. That's because ALL the entries garnered a good number of votes, making the winners very close, with much lower percentages. The third place winner made it with 13% of the vote, and it's a great Sideshow release - Poison Ivy! The readers didn't show her the love, but the Poppies Judges suer did. Sideshow has had a great year with both the DC license and with their statues, and she's the best example of the two connecting beautifully. The second place winner jumped in with 14% - it's the Killing Joke Joker from Kotobukiya! It was my top pick, and the people gave it a silver as well. While it's not quite as 'high end' as some of the other statue lines on the market, the quality and options set it apart. The winner was a bit of a surprise to me. I assumed the Mythos Obi-wan would do well with the judges - several of them had spoke up to ensure it was on the ballot - but he was snubbed from the top three. 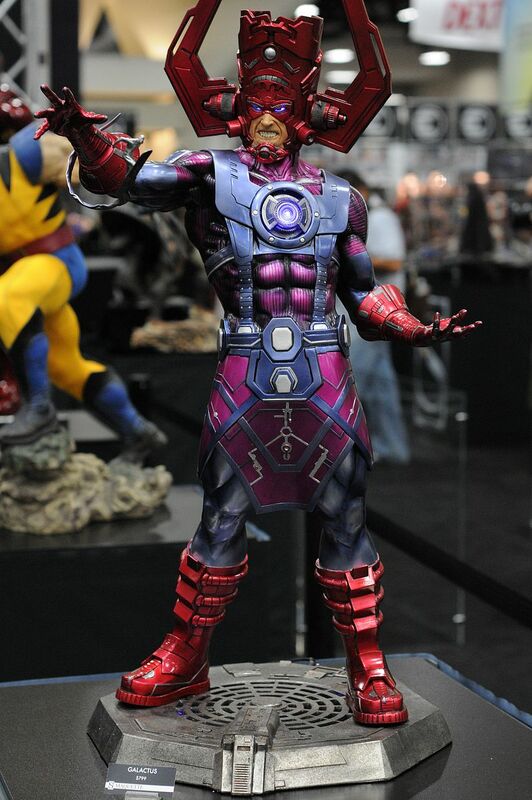 Instead, another Sideshow statue took the top spot with 27% of the vote - Galactus. It's a beautiful representation, but I bet its win generates some conversation. 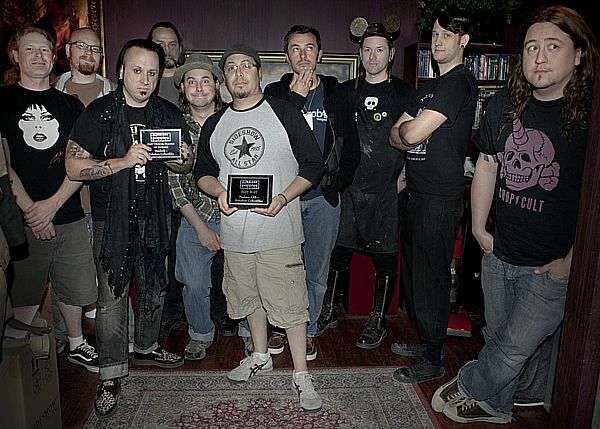 There's no doubt that Sideshow deserves the kudos in this category for 2013, and their 2014 line up looks amazing as well. Another tight category, with votes going for just about every nominee. Bowen always does some amazing busts, but I thought their Groot was just amazing. The design, the detail, the paint work - everything just came together perfectly. About 10% agreed with me, giving him the third place spot. The second place spot was snagged with 13% of the vote, and as a life sized bust, it has scale on it's side. Sub Zero from Pop Culture Shock Collectibles is the sort of collectible that wows everyone that sees it in person. The big surprise to me is two fold - first, that Hot Toys was completely ignored in this category by the judges. They did get votes for their Iron Man 3 releases, but not enough to crack the top three. And second, that the somewhat different style of the Gentle Giant "Magnitude" Ackbar grapped the top spot. A strong 23% of the judges felt that this version of the famous Admiral was the best of the year, easily enough to win the top spot. I think the judges did a nice job this year putting in some unique and unusual figures in this category. It's always tough to get them all, but there were great choices nonetheless. One of those unique lines took 11% of the vote and third place - the Walking Dud. It's probably not surprising that something related to the insanely popular Walking Dead would do well, but it's not enough to be a parody - you have to do it well, and they did. Second place is a tie, with two figures getting 16% of the vote. The middle spot is shared by the Hot Toys Iron Man 3 Cosbaby, and the nifty Roboforce line. They couldn't be much more different in style, but they both speak to a large group of collectors. 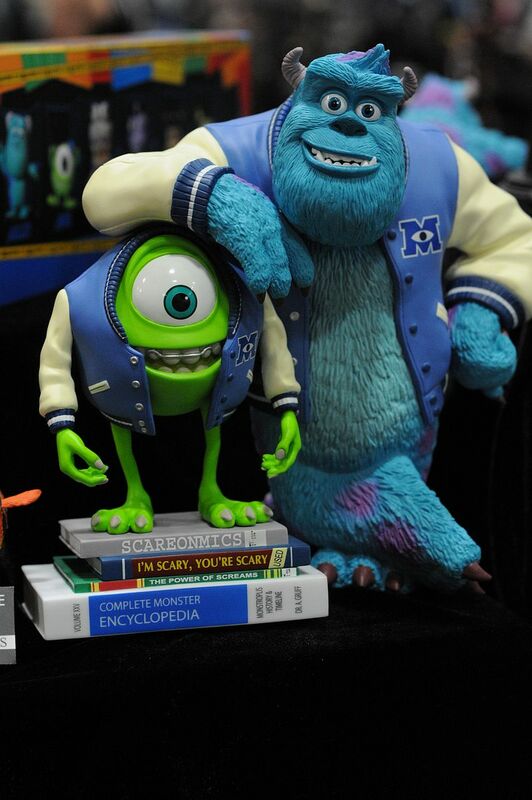 Hot Toys takes the win though, with the same very cool vinyl collectoble that won the People's hearts - the Monsters University VCD. If your a fan of the Monsters, you should grab this one, as it is probably the best collectible produced for the second film. 21% of the voters agee. I love great prop replicas, and with the advent of the 'man cave' and home theater, the demand for well done replicas has certainly increased. The third place winner is a perfect example of a great replica for your home theater - the Ghostbusters Neutrino Wand from Mattel. It took 15% of the vote, and is an excellent addiiton to their other Ghostbuster releases. C'mon, let's get the pack now to complete it! Interesting, 17% of the judges picked a replica that neither myself or the People put in the top three - the Sonic Screwdriver for the 10th Doctor! It's pretty clear that there are plenty of Dr. Who fans amongst the judges. The winner just barely edged out the other two with 18% of the overal vote. Mattel's Batman Utility Belt from the 1966 television show connected with fans in a way that some of the other collectibles based on the show did not. It also helps that it was priced right, affordable to many collectors. And let's not forget that it comes with the cool folding batarang as well! I'm going to be talking with the judges on what we should do with this category next year. Perhaps we need to expand to select the best overall building set, so that the selections are a bit more spread out...I'm open to suggestions. The third place winner here managed to slip into the top three with the fewest votes in any category, taking just 4% of the vote. Kre-O got the bronze, a line that usually doesn't get enough love from collectors. Minimates took the second place spot with just 17% of the vote. While collectors love all things, it's pretty clear that superheroes are still a top draw, and the minimates continue to do an amazing job representing them, as well as a bunch of other cool licenses. Yep, Lego wins again, this time with a massive 71% of the vote. If you haven't seen it yet, go see the Lego movie RIGHT NOW. It will be the best animated movie of the year, hands down, everyone else can just go home. It's time for the mish-mash category, where anything goes! The judges matched the People with their third place pick - 12% of the judges went with the 31" Darth Vader which also included lights and sounds if you found the right one. He's probably the nicest of these oversized figures that Hasbro has produced, although the Clonetrooper is pretty sweet as well. About 14% of the judges went with the only Transformer on the list - the Metroplex was huge, complex, and a ton of fun, but we had a lot of conversation about where it best fit. And when it doesn't fit well anywhere, it's a perfect choice for the Misc category. The winner barely edged out the oher two, taking just 15% of the vote. It was also a surprise, at least to me, since it wasn't on the radar for either myself or the People in their voting. But the Mecha Godzilla (MFS-3 Type 3 Kiryu) from S.H. Monsterarts takes the gold! It's nice to see the classic monsters still have legs - let's hope the new movie doesn't cut them out from under him. There's a few interesting things to note, particularly when you compare the results of the People's Picks and the Poppies. Hot Toys dominated all the way around, but they didn't quite dominate the same way in the Poppies. In two categories - Best Bust and Best Vehicle or Playset - they did take the gold, which is probably a surprise for some. But when you get back to basics and look at the sixth scale categories, they remain the company to beat. It's nice to see the judges appreciate the better toys out there, including the work on the TMNT and MOTUC series. I also noticed that the Avengers series took the top spot for Overall High End Line, but it's the Joker that snags both the Eddie Wires award and the best 12" figure. It really helps that Hot Toys does such an amazing job on a variety of licenses. Another suprirse is the lack of love for the Battle Damaged T-800 from Hot Toys. While they still won the best 12" figure easily, the fact that the pick of the people wasn't even in the top three was a shocker. Overall, I think it was a strong year, with a lot of very nice product produced and a lot less real crap. Even on the mass market shelves things improved, and I'm hoping that all the amazing stuff we're seeing at Toy Fair turns out that great once it hits the pegs.